The story begins in Alaska near the HAARP Complex, one of five previously existing locations refitted as doomsday shelters in case of a Rapid Climate Changing event. Big Thunder was that event. Around mid-century a long overdue earthquake at the northern periphery of the Mid-Atlantic-Ridge caused half of the pockmarked ice-sheet to cascade off Greenland and the following tsunami crashed global civilization. Two weeks later due to pressure being released on the island, the landmass jutted upwards releasing methane hydrates and other greenhouse gases, jettisoning most of the remaining ice. As a result, the thermal oceans currents shut down completely, creating the mid-latitude badlands and ushered in a paleolithic atmospheric/hydrological pattern. After fighting their way north through the Badlands, Abram and the J-Squad rescue four lady scientists under fire from cannibalistic marauders. These scientists, who run the HAARP Complex, are tasked with assisting any survivors in rebuilding civilization. In their gratitude they invite the J-Squad to take up residence at the compound. What follows is an adventure from combating marauders to starting a sustainable culture; the HAARP Letters deals with personal, civil and interpersonal dichotomies. A few issues this mismatched group confronts are the creation of an educational-based merit system, a disputed new religion, Doni Forever, based on Earth First principles, and the same old vices of greed and power lust, that have plagued mankind as once again these arise as civilization begins it journey toward a new purpose on Mother Earth. Okay, everybody likes an end-of-the-world type story, right? The human race refusing to give up under astronomical odds placed against it. Imagine Hunger Games only better. 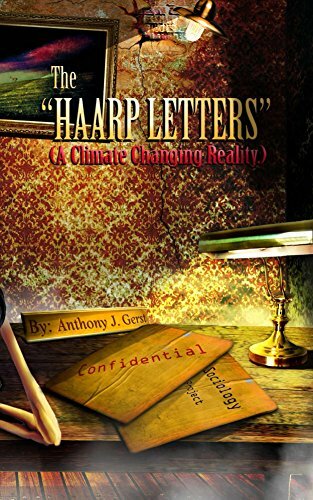 Of the different scenarios I’ve come across in recent years, I have to say The HAARP Letters by Anthony J. Gerst is one of the best. An environmental disaster on Earth leaves a militant group, refugees and scientists on a mission to re-establish civilization. They are thrown in together at the HAARP compound, besieged by violent, cannibalistic marauders. They plan to found a new Gaian religion, their goal to set up and care for the world’s remaining resources. The story is told through a series of correspondence between Abram and his old friend Bill, another survivor living at a different bunker. The beginning is just a tad slow and I admit to struggling with some of the religious elements presented. But if you can put your own personal beliefs aside for the purpose of entertainment, this is a great novel. I worried at the start that a series of letters might be slow and dull, but it wasn’t, not even a little. The characters are instantly brought to life, and the setting brilliant and imaginative. You don’t feel as though you are reading a series of letters. Gerst expertly pulls you in, makes you feel for these people and the world they find themselves trying to survive in, and builds toward an ending that leaves you wanting more. I can’t wait to get my hands on the next one. The HAARP Letters is definitely one you’ll want to take a look at. Posted by Denna Holm on September 5, 2016 in Archives and tagged apocalyptic, cannibles, chilling, earthquakes, entertaining, fantasy, natural disasters, tense.